All in all, a really fun day, quite the experience! 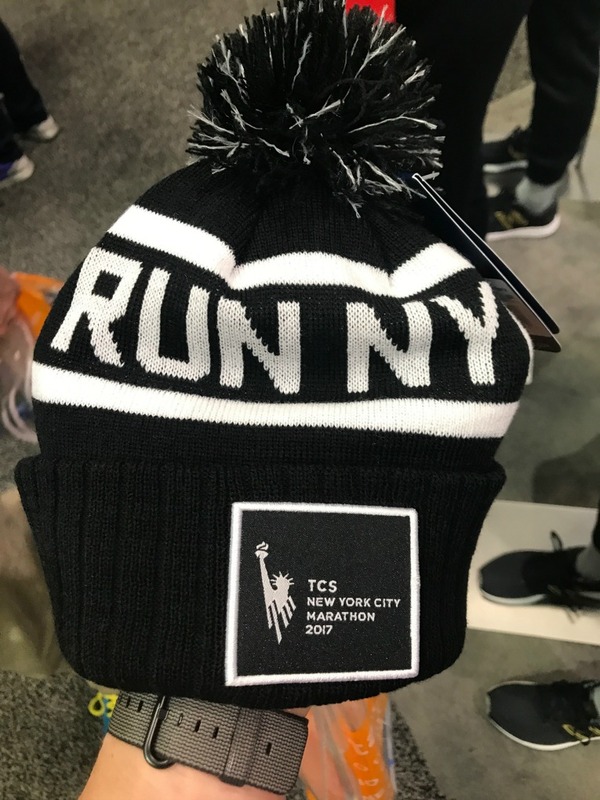 The TCS New York City Marathon is the biggest marathon in the world. It has more than 50,000 participants! It’s definitely crowded at parts. In my personal opinion is that it was one of the hardest of the 6 World Major Marathons. I’d say maybe Boston’s Newton hills are harder, but overall, NYC is harder because of the crowds and the number of hills/bridges. But “hard” doesn’t mean you shouldn’t do it! It’s still an awesome marathon, one that I am so grateful to have had the opportunity to experience. – Receiving this mammoth medal! I shared a bit about the expo in this weekly recap post. We attended on Friday afternoon/late evening, and it was not too busy; in fact, I was impressed by how organized it was. We were able to pick up our bibs/packets quite quickly. For the finisher’s shirt, there were volunteers giving you different sizes to try on, because after you received your shirt, you couldn’t exchange it. I’m glad I tried it on as I had originally asked for a small and switched to a medium. 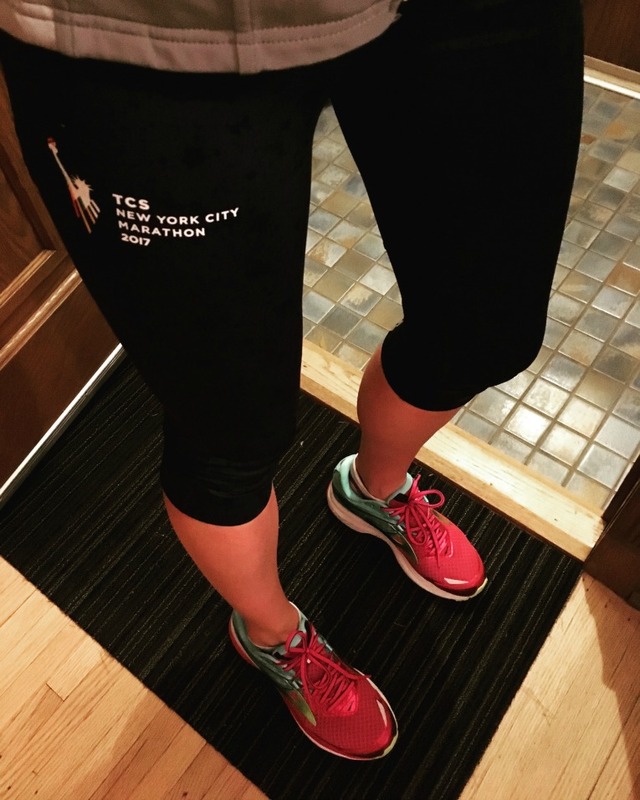 The official NYC gear by New Balance was amazing- I would have bought even more if I could! Our hotel, the Sheraton Times Square, was about a 15 minute walk to the expo, which was doable, even prior to the marathon when you’re trying to stay off your feet a bit more. We did a shake-out run at 7 am with the group from Marathon Tours, then I met up with Jess and Kim for a coffee/chat. After that, Dustin and I had some carbs in the form of pizza at B-side in Hell’s Kitchen. 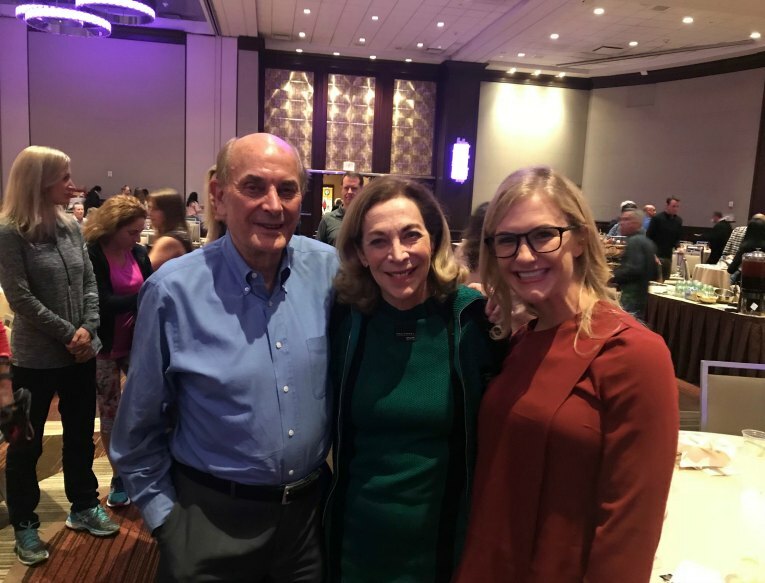 That evening, we attended a pasta dinner with Marathon Tours, which included guest speaker Kathrine Switzer, who is always an inspiration and a joy to hear from. I️ met her two years ago at a Girls on the Run event. 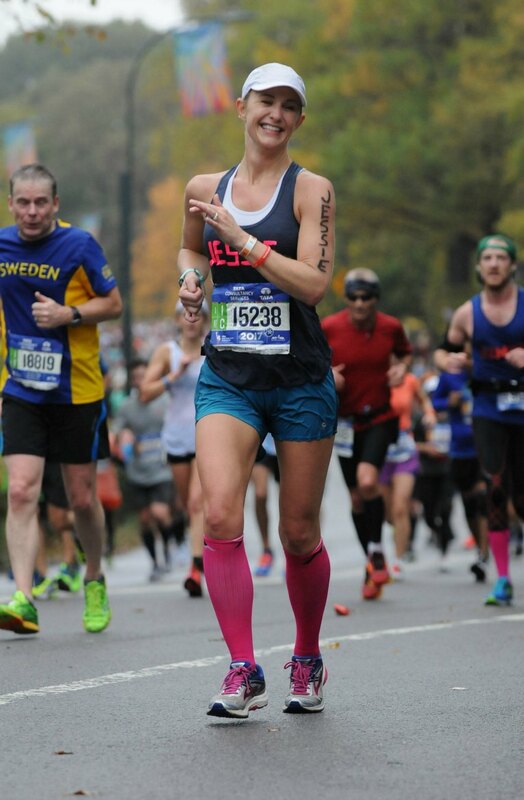 This time, her talk focused more on the New York City marathon and what it meant to her to run it. Very inspirational. Marathon Tours provided grab-and-go breakfasts and a coach bus to the start line, starting at 5:30 am. I ate my standard pre-race meal of a bagel with PB, coffee, some Nuun, and water in the hotel room, but I also brought the grab-and-go box with on the bus as I knew I would need more food before my start time of 9:50 am. We arrived on Staten Island before 7 am with a lot of time to kill before Wave 1. We had both opted for the post-race poncho rather than a gear check bag, so I did not bring my phone with me. Everything I brought to the start had to be left at the start, so instead I brought along a few magazines to read as I waited. Unfortunately, Dustin was in the Blue start and I was in the Green, so we had part ways pretty early. I found myself a comfortable place leaning against a fence, staying warm in my throw-away pants and poncho with my magazines. I heard that there were therapy dogs at the start, but I didn’t see them- darn! It was a lot of waiting around. I ate the small bagel from the grab-and-go box, more Gatorade, and a Honey stinger waffle, but I was starting to get hungry before the race even started! These late start times and running over the lunch hour are tough for me; I mean, I started around 10 am and was running until 2 pm. For some reason, I found this more challenging than I had at Boston, where I started just as late. Finally around 8:20, I went to my corral. 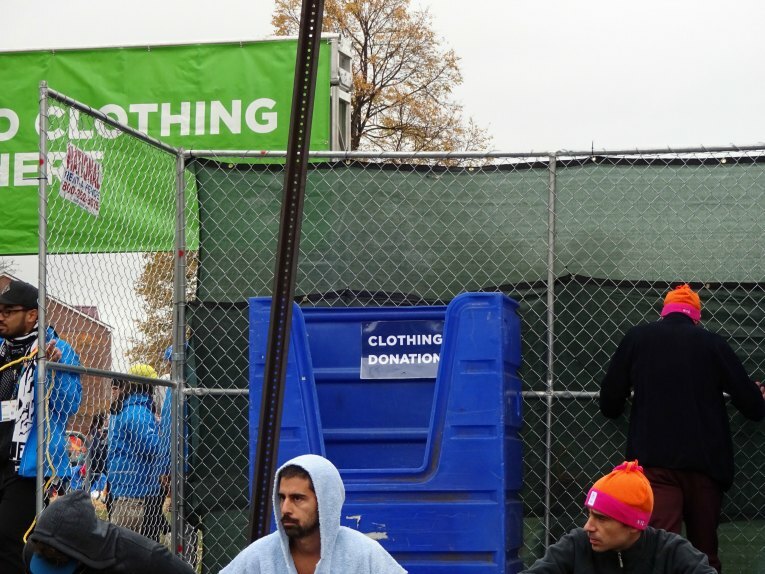 Within the corrals, there were plenty of porta-potties and bins to toss your donated/throw-away clothing. The starting temperature was in the low 50’s, 80% humidity, and overcast. The humidity wasn’t ideal, but the temps and overcast skies were good. Cannons went off for the elites (they kind of scared me!) and then the wheelchair waves started as well. Guess what? The green wave was on the bottom of the bridge, i.e. the “get peed on” wave! Fortunately I knew to stay in the middle of the bridge, haha! 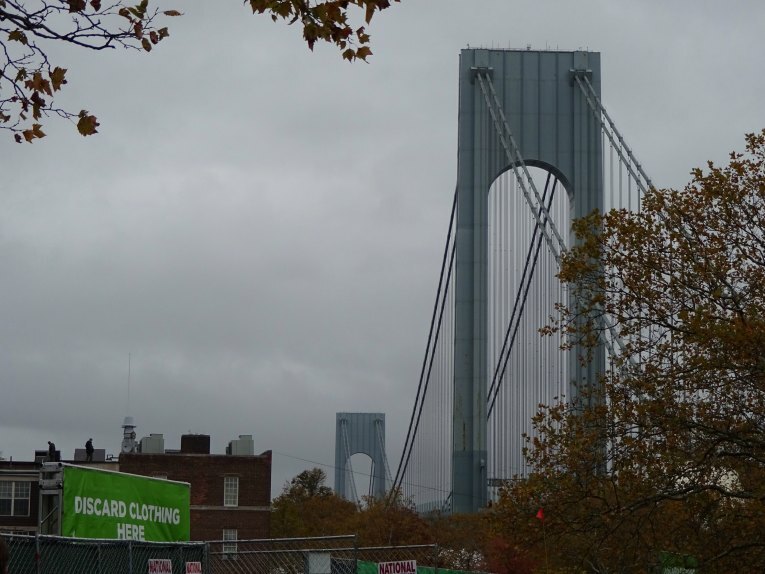 It was a tough first mile uphill onto the Verrazano Bridge. I wish I would have been on the top of the bridge instead of the “pee” bottom, as I think the views would have been better, but I could still see out across the water at the skyline. So cool! I knew that this mile would be slow due to the crowds and the uphill, so I didn’t worry about my time at all here. What goes up must come down! After a slow first mile, the downhill second mile felt like a breeze. I knew I was moving fast but it felt really easy. Now I settled into my goal pace, somewhere around 8:30’s. This was a fun part of the course in Brooklyn. 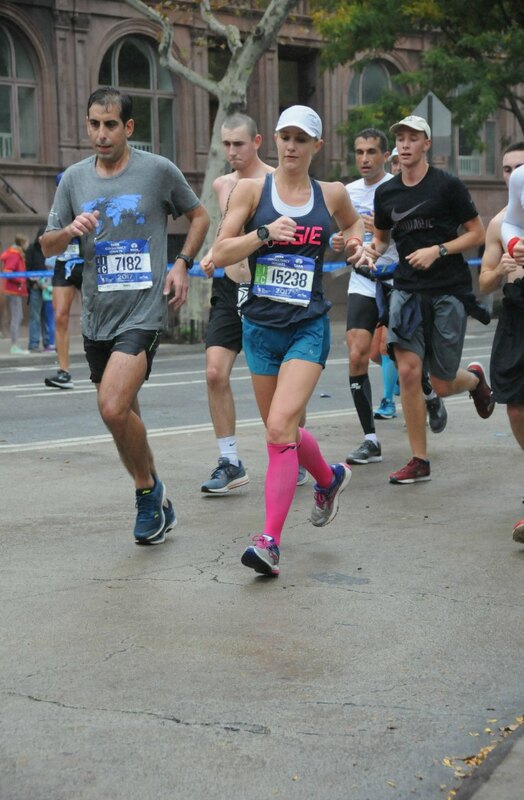 I haven’t really spent much time in Brooklyn, so I took it all in and tried to look around and smile at all the awesome spectators calling my name. I really loved this part of the course. So fun! Tons of bands, tons of energy. 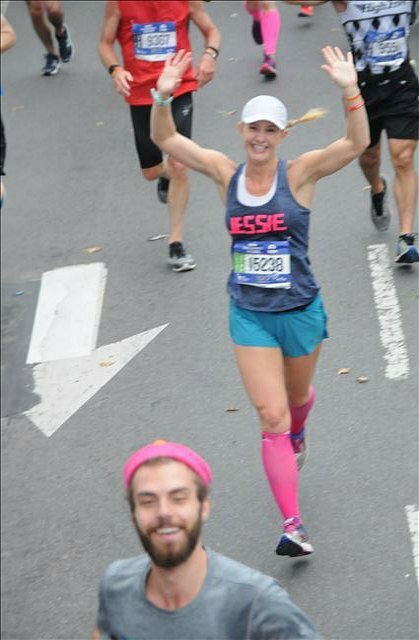 The course runs on 4th Avenue for miles 4-8, through Brooklyn…I could not stop smiling. I was having the time of my life! I think this is when we were in South Williamsburg, which is an Orthodox Jewish neighborhood. There was not a lot of cheering here, but I actually found it to be a very memorable part of the course. Apparently Sunday is a workday for this community and there were a lot of people darting across the course (some dangerously so!) just going about their day as if it was a day like any other, rather than the day that 50,000 runners came through. I saw my friend Tricia around this part. She was out cheering with a big group. Fun to have familiar faces in the crowd! I believe we crossed another bridge here, the Pulaski Bridge into Queens. Oh boy, the toughest bridge (in my opinion)- the Queensboro bridge! 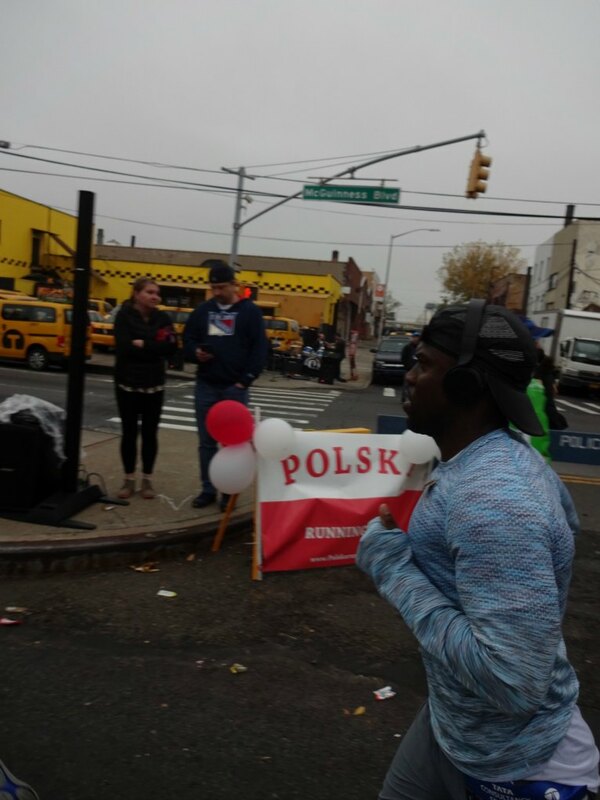 This was also when I realized that I was running next to Kevin Hart. 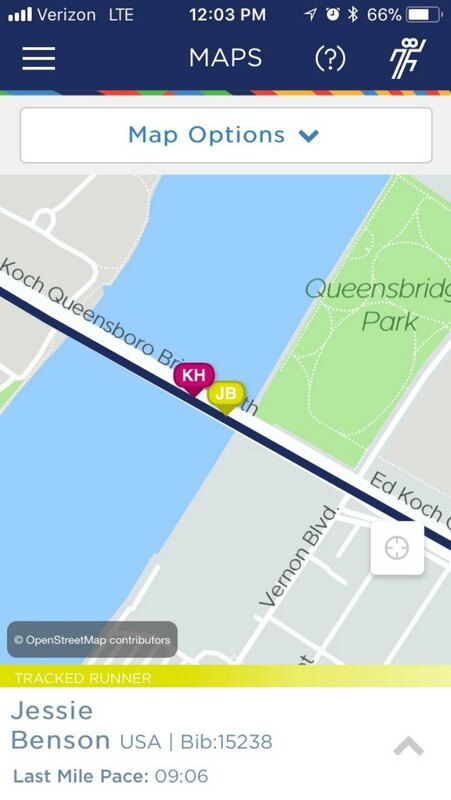 Kim sent me this screenshot from her phone, where she was tracking us both on the bridge! He had a few ‘pacers’ i.e. bodyguards keeping the rest of us ‘regulars’ out of the way. I couldn’t believe that he was wearing long sleeves and pants- wasn’t he HOT? I was wearing a tank and shorts and was sweating quite a bit due to the humidity. I had tossed my arm warmers in mile 2 and felt good in much less clothing than him. On the bridge, Kevin started walking and I pulled ahead. (He ended up finishing in 4:05). I had hoped that I might end up in some of the paparazzi pictures since we were together for several miles. So far, I haven’t seen any with me in the background 🙂 Let me know if you do! Yay downhill! After coming off this bridge, the crowds are nuts! Some people describe coming onto First Avenue as entering a “wall of sound” that you can actually FEEL. I felt like a superstar with so many people cheering for me. This was also where Kim was cheering and my friend Jehan and her husband. Somehow I missed Kim, but I did see Jehan, even though she was on the other side of the course! I think there was another bridge here, the Willis Avenue Bridge. I was starting to hurt. This wasn’t quite as easy as I had hoped (or as easy as the 3:49 I ran in London). It was still a marathon, and surprise, surprise, marathons hurt! I couldn’t expect it to be that easy, even if I wasn’t running a PR pace. I was definitely working and counting down the miles. Still smiling though- smiling makes you a better runner, right? After this bridge, you enter the Bronx, which is another neighborhood that I had never explored. I tried to look around and take it all in. Through the Bronx to the final bridge, the Madison Avenue Bridge, and then onto 5th avenue. From 110th to 90th, it’s a gradual one mile hill…an evil hill! Mile 24 was my slowest mile. 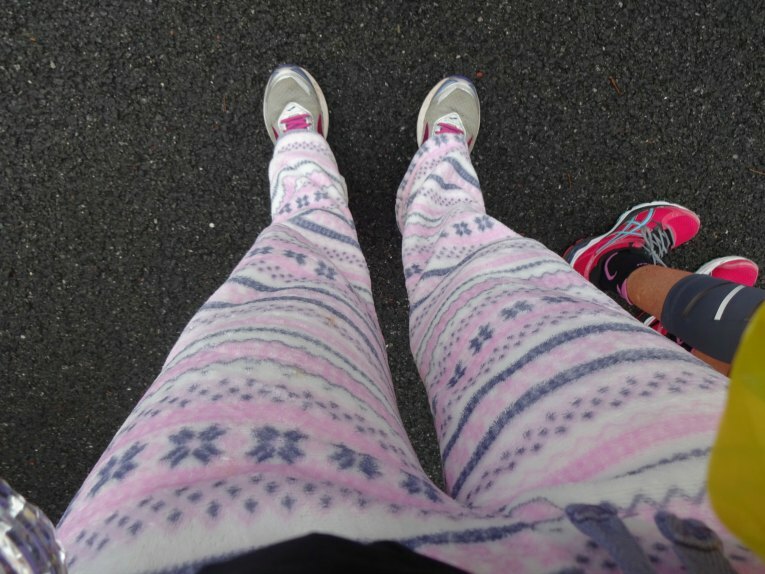 I didn’t walk, but I definitely was “jogging”…slowly. You get to Columbus Circle and re-enter the park…the finish line is in sight! I crossed the finish line, got my medal, and nearly missed the Abbott 6 Star Finisher’s Booth! Luckily a volunteer spotted me and called me over. I don’t know if she saw the bib on the back of my shirt or the sticker on the front of my bib, but I’m so glad she caught me. I got my HUGE medal and then was interviewed about my experience. I don’t know what exactly the interview was for (maybe the Abbott news?) but they were looking to talk to the female finishers as they said not a lot of women have finished the 6 Majors. I felt so special! During the race, I actually got of “congrats” and people chatting about where they were on their 6 star quest. It was a fun idea that Abbott gave us those extra bibs to wear on the back! I also felt so special walking around with that medal after the race- so many people would stop Dustin and me to say congratulations and share where they were on their 6 star quest, often taking pictures of the medal! So fun. After my interview, I got my heat sheet and recovery bag, which was filled with a Gatorade protein drink (it wasn’t bad) an apple, water, regular Gatorade, a protein bar, and more. Then I started the very long trek out of the park and to the post-race poncho area…my goodness was this a long walk! My legs weren’t actually feeling that bad and everyone around me was walking so slowly or talking on their phones or taking selfies, I just wanted to get through the crowd and find Dustin at the family meet-up area! I think I crossed the finish line around 2 pm and I didn’t find Dustin until nearly 3 pm. Then we had to make our way through the crowd back to our hotel (which was CRAZY/chaos). The walk wasn’t really that far, but it felt like an eternity! I’d say the post-race chaos was my least favorite part of this marathon. Or my least favorite part might have been the late start time, as I do think I do better with early marathons, that start anywhere from 6-8 am, since that’s when I generally run anyways. 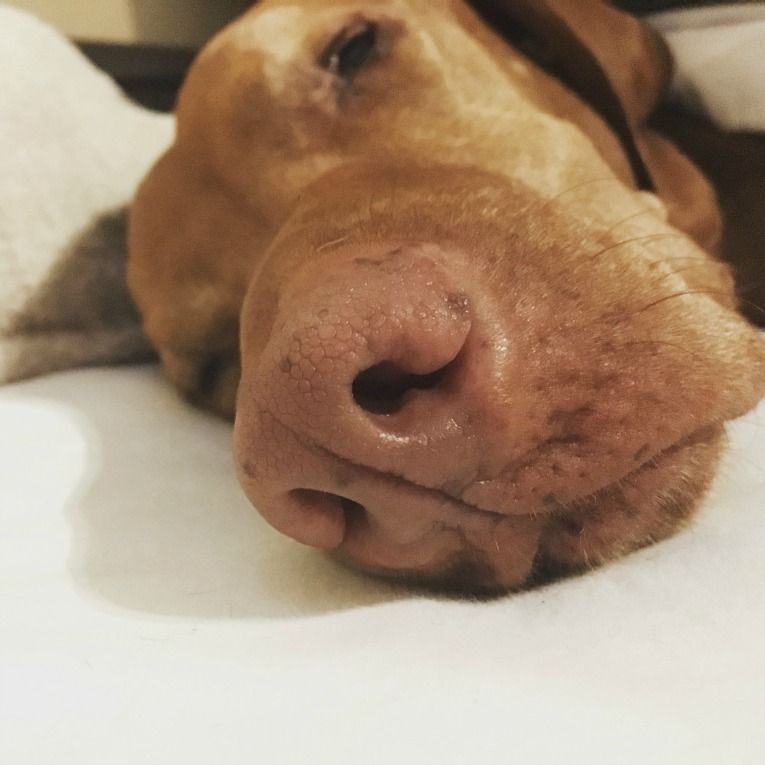 Running over the lunch hour was tough. But those two things are just part of the experience with New York. It’s really amazing how the organization is able to succesfully pull off such a monumental and LARGE event in such a busy city. So impressive. Oiselle Roga shorts, Athleta Shadow Stripe Chi tank, Sweaty Betty sports bra, Pro Compression marathon socks, Brooks Ravenna shoes, Lole hat, Garmin 235, and this SPI belt. I also swear by GoodSport to prevent chafing. Rainy and sweaty 26.2 but no chafing! Try it out. We got back to our hotel, showered, ate some of the snacks from our recovery bag, and then joined up with the Marathon Tours group in the lobby bar for a post-marathon celebratory drink. 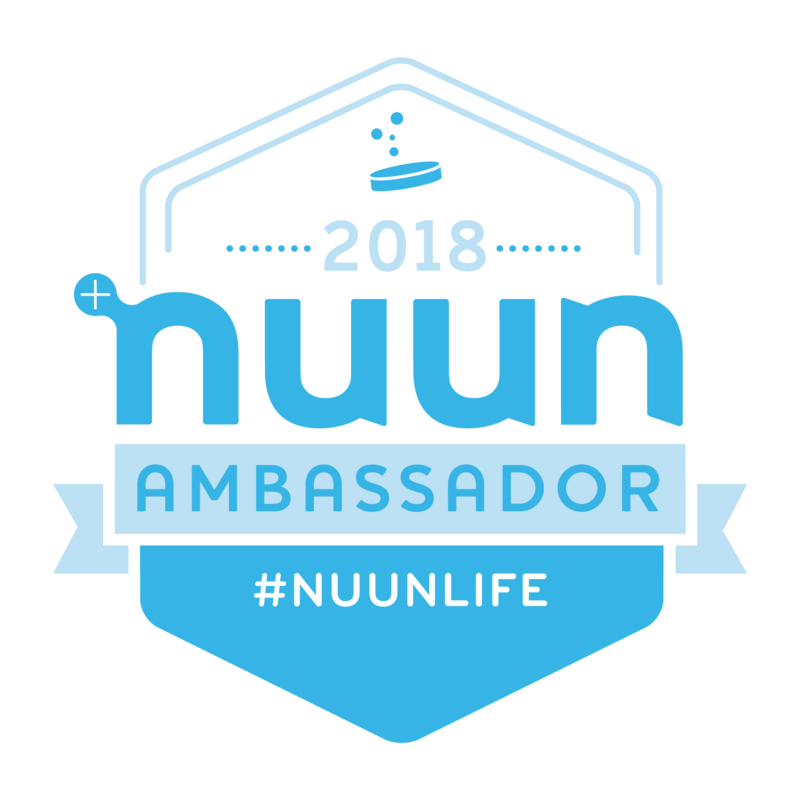 Everyone we met through Marathon Tours was really nice, and I am really excited to travel with some of them in March when we do the Antarctica Marathon. I was so ravenous by the time we made it out to dinner…it wasn’t a smart recovery to have a drink first and no food! But after some food, I felt so much better. After dinner, we stopped by for a cookie at Schmackary’s Cookies (yum!) and then Ubered back to the hotel where we both crashed hard. Marathons will do that to you! It was a long day, but still a memorable one. 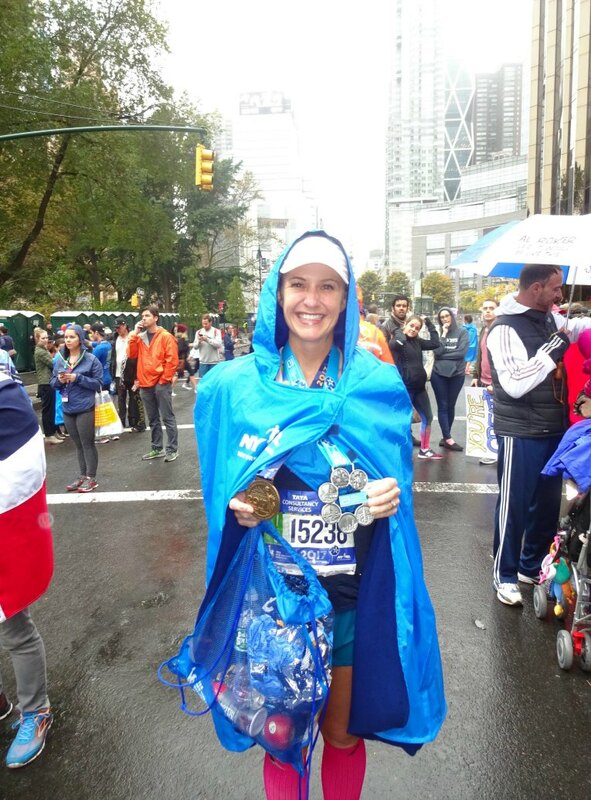 Fantastic marathon, NYC! 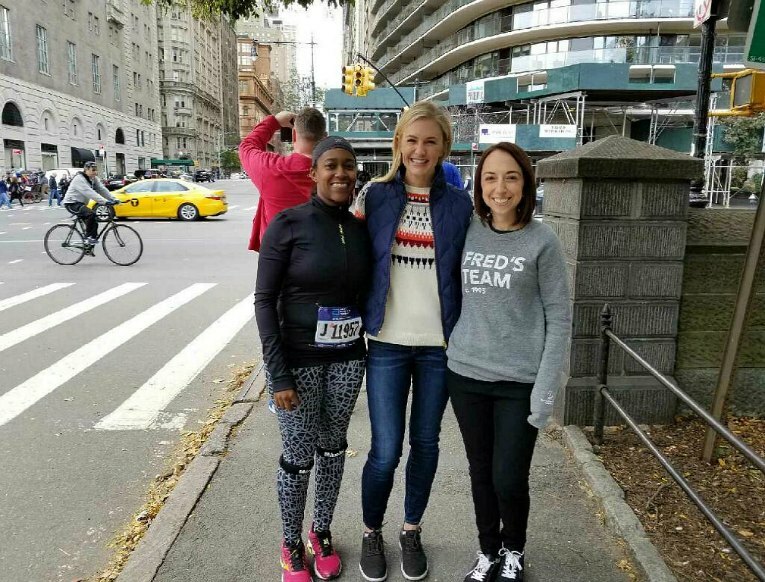 On Monday, we had a delicious brunch at Blue Dog Kitchen in Hell’s Kitchen, then checked out the Marathon Monday events in Central Park, before catching our flight back to Minneapolis. In hindsight, we probably should have added an extra day onto the trip to see a show, go to a museum, or just eat more amazing food. 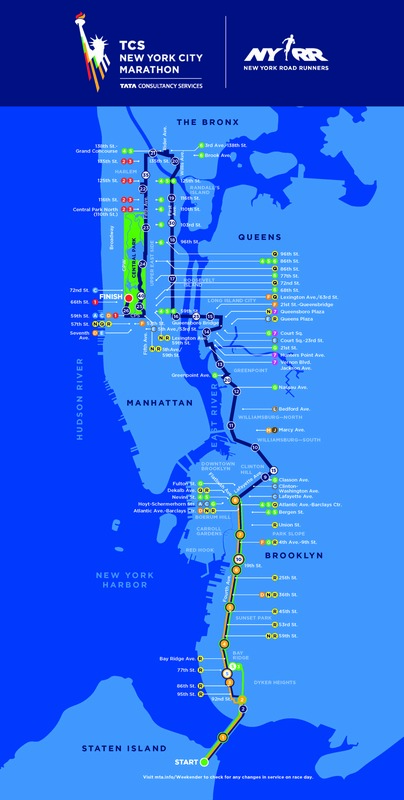 But it was still a great weekend- I mean, we DID see all 5 boroughs and 26.2 miles of NYC. We covered a lot of ground in a short weekend! Special thanks to Monica and Pete for watching Matilda while we were gone! They are dog parents to Darla, who we have dog-sat in the past. Tilda had quite a fun weekend with them. She came back just as exhausted as we were, ha! 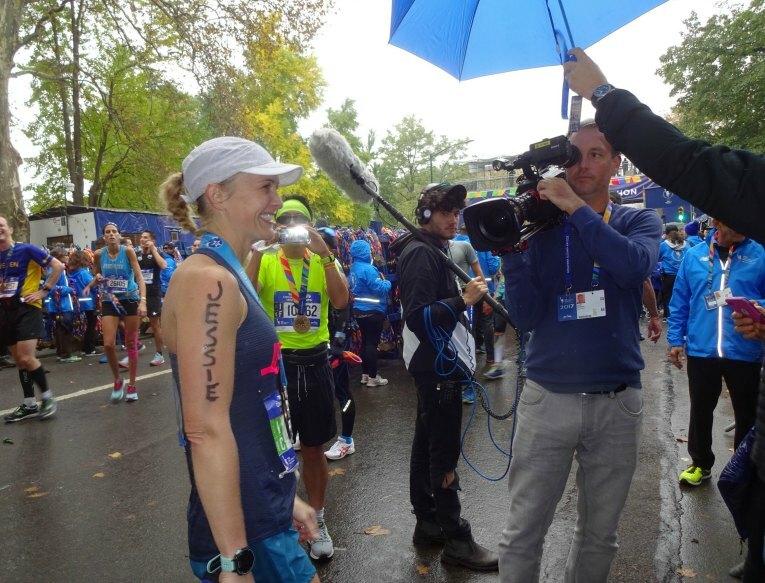 In summary, the NYC marathon is a “can’t-miss.” It truly belongs in the World Majors. Running it feels like you are part of something really special. I’m very grateful for the experience and will cherish the memories of this amazing race. 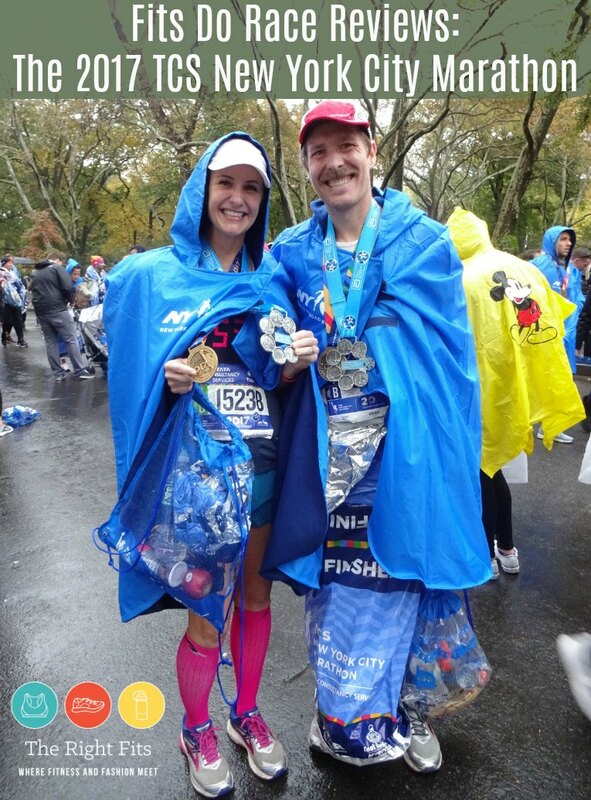 Congrats on an awesome marathon and a bigger congrats on completing the World Majors! So cool! 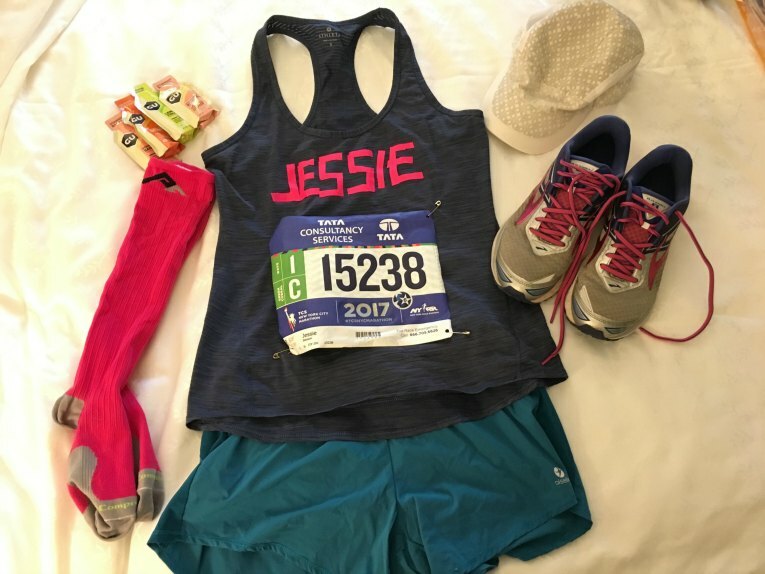 You look way too good to be running a marathon 🙂 Is your name spelled out with tape? 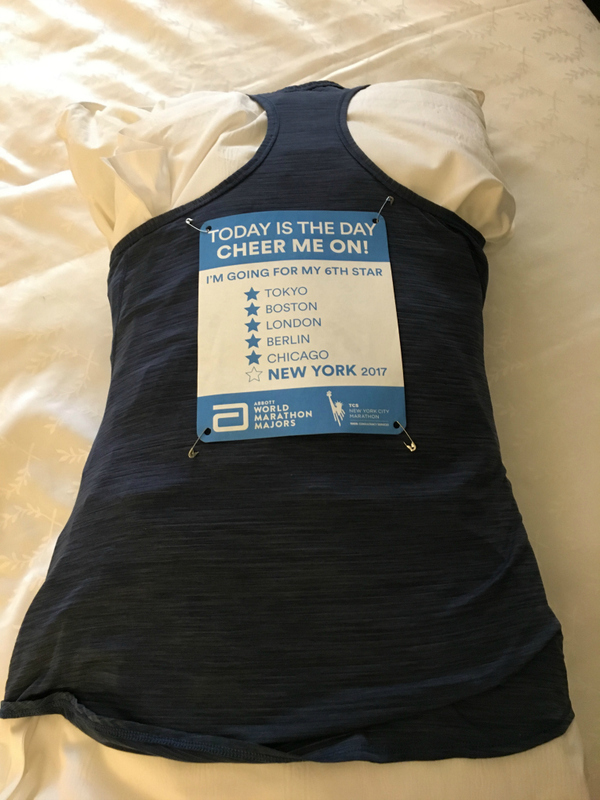 I ironed on my name for 2 previous marathons but I don’t want to ruin the tank I want to wear at Philly…any suggestions on tape (if that is what you used)? Kim, thank you! It was a fun, fun weekend in NYC! I did use plastic tape from Target. It isn’t actually that great, I’m surprised it stayed on in the rain. It has fallen off before in other marathons 🙂 I’d say I usually finish with at least part of my name still on there, haha! Jess from Jess Runs ATL used iron ons- those seem much better, but you’re right, then you might not be able to wear that shirt again unless you want your name on it always! Congrats on your marathon and completing the 6 major series!!!!! You truly are an inspiration!!!!! Congratulations and great recap! You’re do right about those darn bridges – those were definitely the hardest part of the race for me last year! Thanks Kim! Ugh, the Queensboro bridge, I tell ya! This is such an amazing experience, I’m so happy for you! So why do they call the bottom bridge the pee bridge? Have there been stories of the people on the top peeing??? When I did the NYC half they had the therapy dogs and there was a yellow lab like the one I have at home. That was just the highlife of my morning before the race even started! 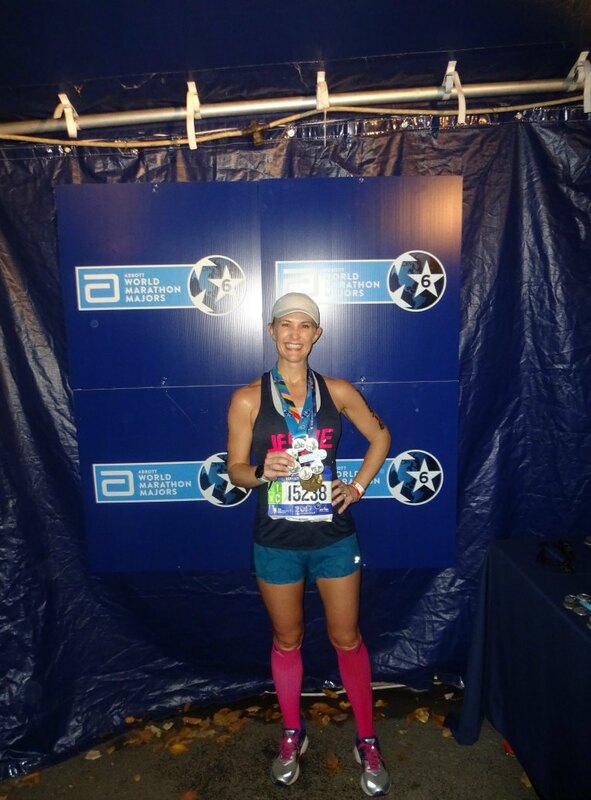 Congrats on earning the final marathon major! Yup, apparently the people on top pee over the side and it can hit the people on the bottom! Congratulations! What a great race recap! 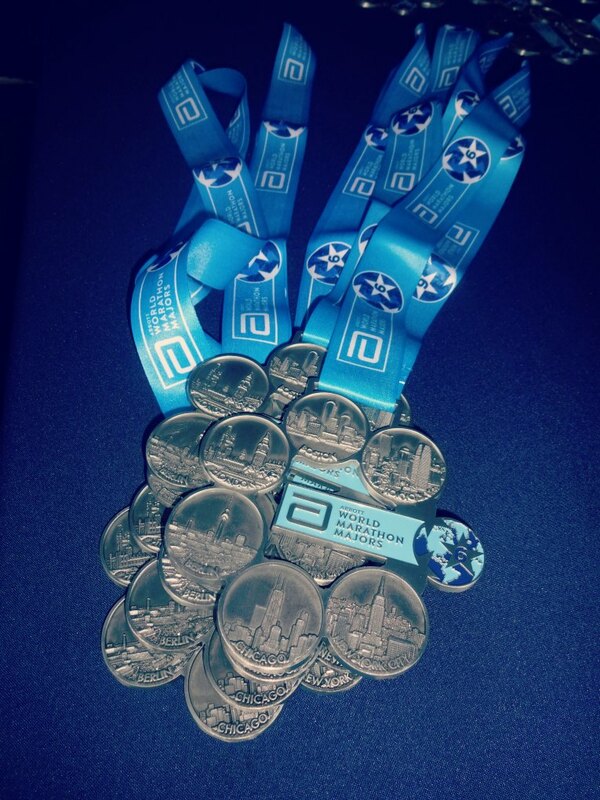 It looks like you had an awesome time and I love the world marathon majors medal, how cool is that?! Thank you Sara! It was a fun pursuit- seeing the world via running! I heard a rumor they are adding a 7th though, so TBD on what’s next! Congrats on finishing the World Majors!!! I decided this year I want to run them as well. 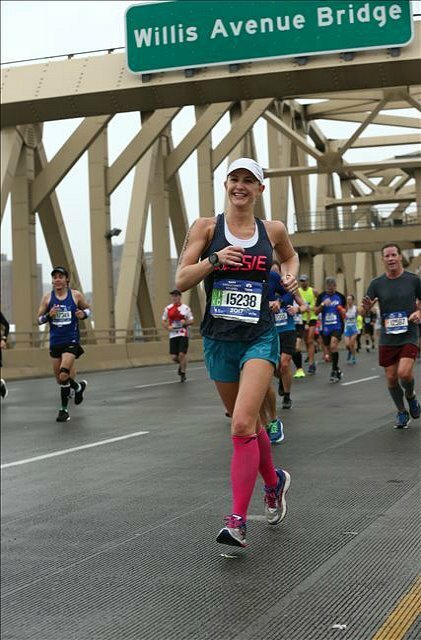 I ran Chicago this year and plan to run London in 2019. 1 down 5 to go!! That’s awesome Kori! It’s a fun way to see the world with running 🙂 Best of luck! Those extra bibs on your back are such a cool idea. 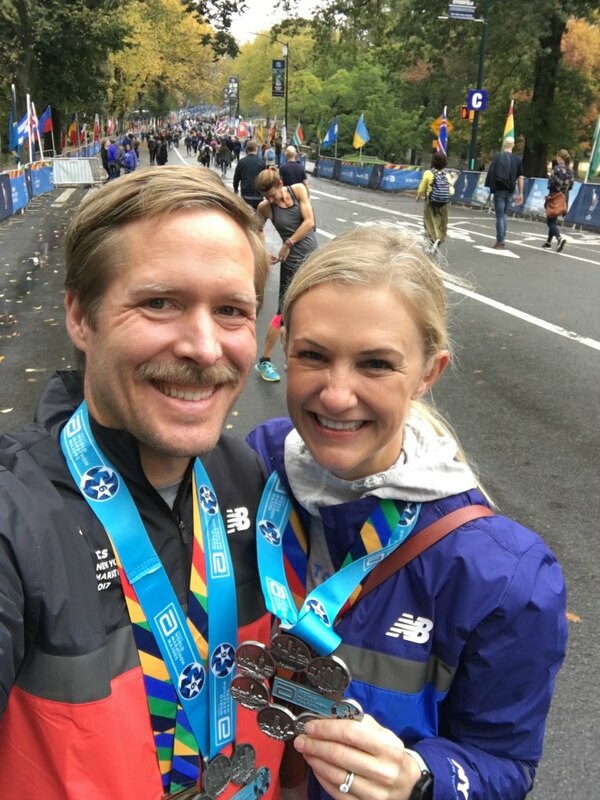 Congrats on your 6 marathon majors! I will be running my first NYC Marathon in Nov. and out of all the reviews and feedback I’ve read, this has been the most helpful one so far!! Thank you for such an awesome recap! I do have a question – I selected the poncho over a checked bag, but I’m curious – you said you did not bring your phone. Could you have, if you wanted to, worn a running belt to hold your phone/food in? Or is any bag/belt of any kind prohibited if you selected the poncho? Thanks so much for your advice, and CONGRATULATIONS to you!! Hi Stephani- yes, you definitely could have brought your phone in a running belt! I just decided to bring a crappy small camera to be safe, since it was raining. But I would say bring your phone for sure! Good luck and let me know if you have any more questions! Hi Jessie and Stephanie – sorry for jumping in but this is the issue I’m curious about as well and while I’m googling to get info I found your article- thank God! So, this mean the runners are allowed to wear running belt during the race, right? By the way, congratulations to you Jessie. You are awesome!